Traditional delivery trucks are the backbone of the modern delivery business for good reason. They’re built to haul large amounts of cargo over long distances, and they do their job well. However, as urban centers become ever more congested, and online shopping becomes more popular, the drawbacks to these vehicles are becoming ever more obvious. Sending a large truck through densely packed streets with limited parking creates more greenhouse gases and slows delivery times. Add more orders every year, and we’ve got a real problem. Alternative delivery methods, like drones and cargo bicycles, give us an opportunity to mitigate the negative effects of parking, traffic, and use of fossil fuels. Cities are already looking at a future where consumers purchase over half of their goods online. While this might rattle the whole supply chain, it’s the “last mile” (the distance between the last logistics hub to a package’s final destination) that’s going to feel the most pressure. Keep in mind, this trend isn’t just affecting businesses — it’s affecting our entire infrastructure. Already crowded inner-city roadways are about to face a whole lot more stress, not to mention idling trucks in dense traffic put unhealthy doses of greenhouse gases into our atmosphere. Finding parking wastes time and sometimes drivers have to stop in places that block traffic because they just don’t have any other choice. On top of this, if recipients aren’t there to receive their packages, that means a truck has to make a second delivery — more wasted time, fuel, and money. 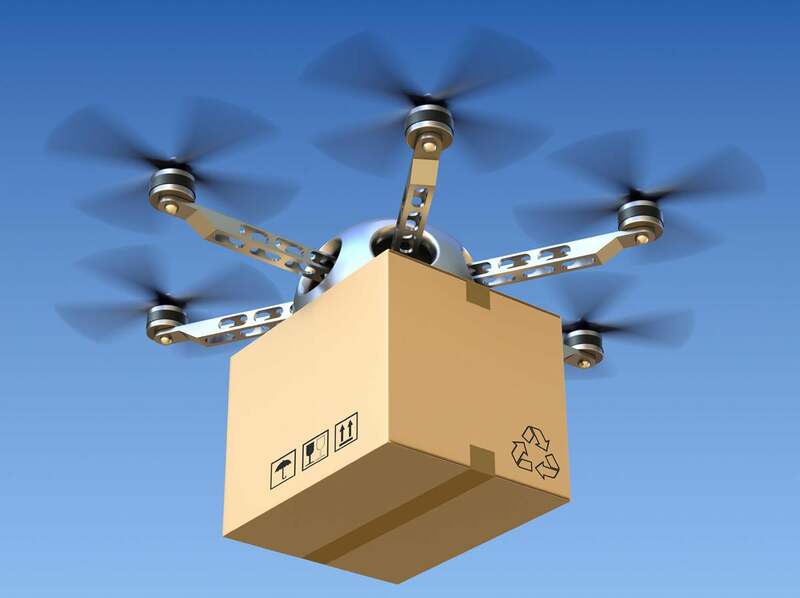 While many municipalities are working on ways to improve parking and solve the issue of missed deliveries, alternative delivery methods such as bikes and delivery drones are a way to literally circumvent the problem altogether. They’re also delightfully eco-friendly. Reports show that ecommerce is in the midst of a boom, and numbers are continuing to skyrocket. Modern consumers want goods, and they want them now! Same-day delivery is increasingly becoming a selling point, and people are willing to pay a premium to get it. The numbers don’t lie: we don’t like to leave home for our errands if the errands can simply be brought to us. Forget to pick up a birthday present? Don’t want to pick up that box of Peaches ‘n’ Cream oatmeal you forgot when you last went to the grocery store? Let the drones fly! Even standard delivery is much faster these days. I remember waiting a week for most of my packages ten years ago, and now two-day delivery tends to be the default. We’re shaving off time wherever we can. Delivery this fast not only means we’re not waiting as long, but also that we can order things online that we’d normally buy at a physical retailer. Take food, for example. I, personally, put off grocery runs as long as I can. It’s time consuming and requires its own slot of time in the middle of my day. If I could simply write up my list in the morning, place an order, and have the goods delivered later that afternoon by the time I return from work, I’d have a whole block of new free time. Of course, same-day food delivery is already a thing in many large cities, courtesy of — you guessed it — Amazon. Their new Amazon Fresh service brings your groceries straight to your doorstep on the very day you order, provided you’re proactive enough to place your request by 10 A.M. that morning. It’s no stretch of the imagination to picture a near future where your food isn’t brought by truck within hours, but by drone within minutes. Where seconds and ounces make a difference, business owners are coming up with ingenious ways to meet demand as well as preserve the Earth. Shipping companies from Frankfurt to Portland are tackling these issues head-on by replacing traditional delivery trucks with an alternative that is eco-friendly, fast, and relatively inexpensive: courier bikes. In the 1939 documentary “The Wizard of Oz”, we saw the Wicked Witch of the West deliver an entire farm and its inhabitants, via rusty bicycle, from rural Kansas to the burgeoning capital of Munchkinland. Technology has only improved since then, making pedal-powered transportation faster and more energy efficient. German logistics company DHL has recently introduced their “Cubicycle,” a quadricycle capable of carrying removable containers that match the size of a standard shipping pallet. Replete with electrically assisted pedaling and dimensions that fit the width of a bike lane, they enable couriers to quickly move from stop to stop without the usual hindrances or costs faced by traditional delivery vehicles. To further enhance their inner-city delivery capabilities, DHL has just this year rolled out the “City Hub,” a trailer that can carry four Cubicycle containers, a load normally carried by two DHL transport vans. These trailers are driven to a drop-off location in a given city, their containers offloaded onto bikes. They then collect any outbound shipments before leaving. By employing these hubs, they’re taking yet more vehicles off the road, and moving your packages from the street to the bike lane. With all this in mind, what does this mean to us as a packaging company and you, a business owner or consumer? As the technology develops our ability to be quick, clean, and sustainable, it’s important for us to invest, adapt, and encourage innovation. As we take to the skies and put feet to pedals, we’re engaging in a practice that both keeps us ahead of the curve monetarily and ensures that we have a healthy future for our planet. When we move our products through alternative channels, we’re not just making faster deliveries. We’re relieving pressure on an overburdened road system, decreasing pollution, and making room in our cities for you and I — not to mention making that work commute a bit more bearable. By following the example of companies like DHL to consistently attempt to improve their efficiency and lessen their impact on nature, we’re acting as responsible members of both the economy and the environment. It’s on us to put our best foot forward and identify problems with the way we do things now. It’s imperative that we see ourselves not as individuals or corporations, but as neighbors and partners. The old idea that financial success is inversely related to eco-friendliness is becoming more dated by the year. It’s more possible now to be fruitful in both regards than it’s ever been. By harnessing the power of modern technology like bikes and drones, we’re creating a new infrastructure with a sustainable future. Last mile delivery is only the first step.